Cervical cancer is a highly preventable disease that exposes the marked disparities in women’s health around the world. Despite a highly effective vaccine and screening technologies, over 500,000 women are diagnosed with the disease every year, with about 9 out of 10 cervical cancer cases and deaths in low-resource countries. One such country is Kenya, which has a low cervical cancer screening rate and a high incidence rate. In order to implement an evidence-based cervical cancer prevention program, we carried out focus group discussions with key stakeholders in rural western Kenya to evaluate barriers and facilitators to screening. Participants identified education around HPV, cervical cancer, and screening as very low in the community as main barriers to screening. Community members reported fear of pain and embarrassment as significant barriers to a screening pelvic exam. They also reported that providers’ lack of knowledge and discomfort with a sensitive subject were significant barriers. A personal connection to cervical cancer and/or screening was associated with willingness to screen and awareness. Providers reported workload and lack of supplies and trained staff as significant barriers to offering services. To be effective, cervical cancer programs must take into account the local realities in which they occur. This study took a systematic, theory-driven approach to identifying intervention strategies based on focus groups and interviews with community members and healthcare providers, and used the results to further contextualize an evidence-based implementation strategy. Campos, N. G., Kim, J. J., Castle, P. E., Ortendahl, J. D., O’Shea, M., Diaz, M., & Goldie, S. J. (2011). Health and economic impact of HPV 16/18 vaccination and cervical cancer screening in Eastern Africa. International Journal of Cancer, 130(11), 2672–2684. doi: 10.1002/ijc.26269. Darlin, L., Borgfeldt, C., Forslund, O., Henic, E., Hortlund, M., Dillner, J., & Kannisto, P. (2013). Comparison of use of vaginal HPV self-sampling and offering flexible appointments as strategies to reach long-term non-attending women in organized cervical screening. Journal of Clinical Virology, 58(1), 155–160. doi: 10.1016/j.jcv.2013.06.029. de Sanjose, S., Diaz, M., Castellsague, X., Clifford, G., Bruni, L., Munoz, N., & Bosch, F. X. (2007). Worldwide prevalence and genotype distribution of cervical human papillomavirus DNA in women with normal cytology: A meta-analysis. The Lancet Infectious Diseases, 7(7), 453–459. doi: 10.1016/S1473-3099(07)70158-5. Diouf, K., Sawaya, G. F., Shiboski, S., Magure, T., Makunike-Mutasa, R., Darragh, T. M., … Smith-McCune, K. (2011). Investigating potential associations between cervical procedures and HIV acquisition. ISRN Obstetrics and Gynecology, 2011, 789106. doi: 10.5402/2011/789106. Dobson, S. R., McNeil, S., Dionne, M., Dawar, M., Ogilvie, G., Krajden, M., … Young, E. (2013). Immunogenicity of 2 doses of HPV vaccine in younger adolescents vs 3 doses in young women: A randomized clinical trial. JAMA, 309(17), 1793–1802. doi: 10.1001/jama.2013.1625. GBD 2013 DALYs and HALE Collaborators, Murray, C. J., Barber, R. M., Foreman, K. J., Abbasoglu Ozgoren, A., … Vos, T. (2015). Global, regional, and national disability-adjusted life years (DALYs) for 306 diseases and injuries and healthy life expectancy (HALE) for 188 countries, 1990–2013: Quantifying the epidemiological transition. Lancet, 386(10009), 2145–2191. doi: 10.1016/S0140-6736(15)61340-X. Herman-Roloff, A., Llewellyn, E., Obiero, W., Agot, K., Ndinya-Achola, J., Muraguri, N., & Bailey, R. C. (2011). 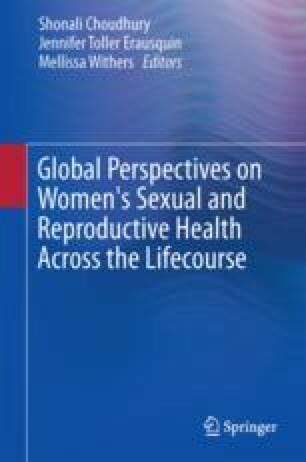 Implementing voluntary medical male circumcision for HIV prevention in Nyanza Province, Kenya: Lessons learned during the first year. PloS One, 6(4), e18299. doi: 10.1371/journal.pone.0018299. Lewin, S., Munabi-Babigumira, S., Glenton, C., Daniels, K., Bosch-Capblanch, X., van Wyk, B. E., … Scheel, I. B. (2010). Lay health workers in primary and community health care for maternal and child health and the management of infectious diseases. The Cochrane Database of Systematic Reviews (3), CD004015. doi: 10.1002/14651858.CD004015.pub3. Obare, F., Warren, C., Njuki, R., Abuya, T., Sunday, J., Askew, I., & Bellows, B. (2013). Community-level impact of the reproductive health vouchers programme on service utilization in Kenya. Health Policy and Planning, 28(2), 165–175. doi: 10.1093/heapol/czs033. Ogilvie, G. S., Mitchell, S., Sekikubo, M., Biryabarema, C., Byamugisha, J., Jeronimo, J., … Money, D. M. (2013). Results of a community-based cervical cancer screening pilot project using human papillomavirus self-sampling in Kampala, Uganda. International Journal of Gynaecology and Obstetrics, 122(2), 118–123. doi: 10.1016/j.ijgo.2013.03.019. Rositch, A. F., Gatuguta, A., Choi, R. Y., Guthrie, B. L., Mackelprang, R. D., Bosire, R., … Farquhar, C. (2012). Knowledge and acceptability of pap smears, self-sampling and HPV vaccination among adult women in Kenya. PloS One, 7(7), e40766. doi: 10.1371/journal.pone.0040766. Sancho-Garnier, H., Tamalet, C., Halfon, P., Leandri, F. X., Retraite, L. L., Djoufelkit, K., … Piana, L. (2013). HPV self-sampling or the pap-smear: A randomized study among cervical screening nonattenders from lower socioeconomic groups in France. International Journal of Cancer, 133(11):2681-2687. doi: 10.1002/ijc.28283. Sankaranarayanan, R., Esmy, P. O., Rajkumar, R., Muwonge, R., Swaminathan, R., Shanthakumari, S., … Cherian, J. (2007a). Effect of visual screening on cervical cancer incidence and mortality in Tamil Nadu, India: A cluster-randomised trial. Lancet, 370(9585), 398–406. doi: 10.1016/S0140-6736(07)61195-7. Sankaranarayanan, R., Nene, B. M., Shastri, S. S., Jayant, K., Muwonge, R., Budukh, A. M., … Dinshaw, K. A. (2009). HPV screening for cervical cancer in rural India. The New England Journal of Medicine, 360(14), 1385–1394. doi: 10.1056/NEJMoa0808516. Schlecht, N. F., Burk, R. D., Palefsky, J. M., Minkoff, H., Xue, X., Massad, L. S., … Strickler, H. D. (2005). Variants of human papillomaviruses 16 and 18 and their natural history in human immunodeficiency virus-positive women. The Journal of General Virology, 86(Pt 10), 2709–2720. doi: 10.1099/vir.0.81060-0. Snijders, P. J., Verhoef, V. M., Arbyn, M., Ogilvie, G., Minozzi, S., Banzi, R., … Meijer, C. J. (2013). High-risk HPV testing on self-sampled versus clinician-collected specimens: A review on the clinical accuracy and impact on population attendance in cervical cancer screening. International Journal of Cancer, 132(10), 2223–2236. doi: 10.1002/ijc.27790. Strickler, H. D., Burk, R. D., Fazzari, M., Anastos, K., Minkoff, H., Massad, L. S., … Palefsky, J. M. (2005). Natural history and possible reactivation of human papillomavirus in human immunodeficiency virus-positive women. Journal of the National Cancer Institute, 97(8), 577–586. doi: 10.1093/jnci/dji073. Vaccarella, S., Herrero, R., Snijders, P. J., Dai, M., Thomas, J. O., Hieu, N. T., … IARC HPV Prevalence Surveys (IHPS) Study Group, IARC HPV Prevalence Surveys (IHPS) Study Group. (2008). Smoking and human papillomavirus infection: Pooled analysis of the International Agency for Research on Cancer HPV prevalence surveys. International Journal of Epidemiology, 37(3), 536–546. doi: 10.1093/ije/dyn033. WHO. (2003). Kenya—World Health Survey. Retrieved from http://apps.who.int/healthinfo/systems/surveydata/index.php/catalog/80/study-description. WHO. (2010). WHO/ICO information centre on HPV and cervical cancer (HPV Information Centre). Human papillomavirus and related cancers in Kenya, summary report 2010. Retrieved July 23, 2015, from http://www.who.int/hpvcentre. WHO. (2013a). Comprehensive cervical cancer prevention and control: A healthier future for girls and women. WHO Guidance Note. Geneva: World Health Organization. Retrieved from Geneva, Switzerland, http://apps.who.int/iris/bitstream/10665/78128/3/9789241505147_eng.pdf. WHO. (2013b). WHO guidelines for screening and treatment of precancerous lesions for cervical cancer prevention. Retrieved from Geneva, http://www.who.int/reproductivehealth/publications/cancers/screening_and_treatment_of_precancerous_lesions/en/index.html. Denny, L. A., Sankaranarayanan, R., De Vuyst, H., Kim, J. J., Adefuye, P. O., Alemany, L., & Bosch, F. X. (2013). Recommendations for cervical cancer prevention in sub-saharan Africa. Vaccine, 31 (Suppl 5), F73–74. doi: 10.1016/j.vaccine.2012.11.077. Ogilvie, G. S., Mitchell, S., Sekikubo, M., Biryabarema, C., Byamugisha, J., Jeronimo, J., & Money, D. M. (2013). Results of a community-based cervical cancer screening pilot project using human papillomavirus self-sampling in Kampala, Uganda. International Journal of Gynaecology and Obstetrics, 122(2), 118–123. doi: 10.1016/j.ijgo.2013.03.019. Tsu, V., & Jeronimo, J. (2016). Saving the world’s women from cervical cancer. The New England Journal of Medicine, 374(26), 2509–2511. doi: 10.1056/NEJMp1604113.